Like the CB41 and CB42 boards, these boards provide connector footprints for Micro D connectors, with the following difference in design: Each board offers one position only for each size, and each board should be populated with either all male or all female connectors. The boards are sold as a set, and you may either install male connectors on one board and female on the other, or all one gender on both boards. A jumper on the board configures the board for the proper gender. Also different is that the CB44 offers a footprint for a 100-pin connector, and thus a 256-point CableEye system is required to use it. 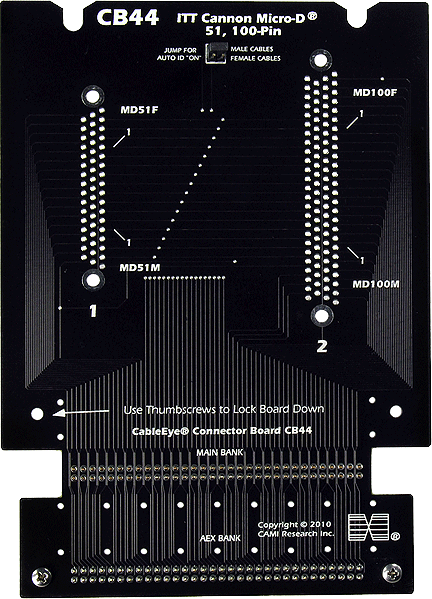 The price of these boards does not include connectors, and each board ships as bare board. If the customer provides the connectors, we will solder them into position and test the boards for a nominal charge; contact us for details. Set of two boards with expander cables. Note: When ordering connectors, choose post length suitable for a 0.093” thick PCB. This is the board thickness of all CAMI CB boards.